Every dog has his day. 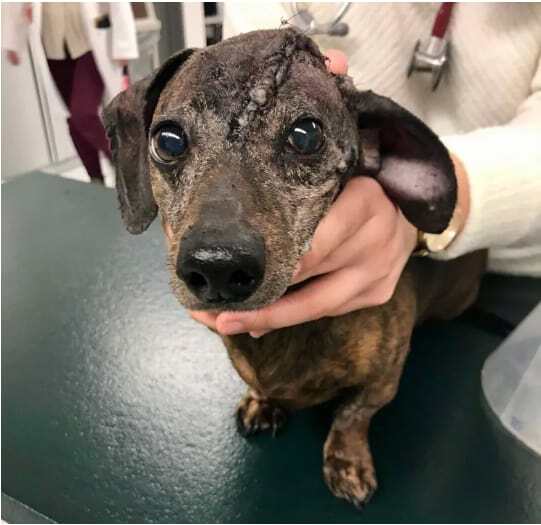 For Patches the dachshund, it was the day she received lifesaving surgery to replace part of her skull with a custom 3D-printed titanium plate. Patches had developed an orange-sized tumor that had started to grow through her skull, and that would have eventually been fatal if it weren’t for the intervention of a team helmed by researcher Michelle Oblak. “The technology has grown so quickly, and to be able to offer this incredible, customized, state-of-the-art plate in one of our canine patients was really amazing,” said Oblak, who is examining cancer in dogs as a model for human cancer. She believes that this surgery technique could one day be used to help humans. The surgery process started with a CT scan of Patches’ head. After that, Oblak teamed up with the University of Guelph’s rapid prototyping of patient-specific implants for dogs (RaPPID) working group, a team that develops 3D-printed dog implants. Together, they mapped the tumor’s location and size, and performed a “digital surgery,” in which they removed the tumor to see how much of the animal’s skull they would need to remove. The model showed that they would need to remove approximately 70 percent of Patches’ skull. 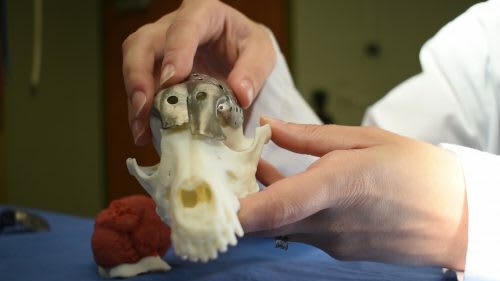 With the digital tumor and the diseased portion of the skull “removed,” the team was able to develop a 3D-printed model of what a skull implant would look like, including holes for screws to hold the implant in place. Generally, when removing a brain tumor, the surgeon needs to wait until the section of the skull has been removed to create the implant, and then has to shape titanium mesh into an implant during the surgery. The 3D modeling meant the team could perform the step in advance, shortening surgery time. “I was able to do the surgery before I even walked into the operating room,” Oblak said of her method. After the team developed the digital model of the skull implant, Oblak sent the plans to ADEISS, a 3D printing company in London, Canada. ADEISS specializes in titanium-printed medical implants for humans, so Oblak worked with them to ensure they could craft an implant that would work for Patches. She also developed a “cutting guide” for the surgeon to follow; a deviation of millimeters would have meant that the implant wouldn’t have fit. The surgery itself was performed at the Cornell University College of Veterinary Medicine by surgeon Galina Hayes. Because of the reduction in surgery time from the 3D modeling, the surgery took only four hours, and Patches was up 30 minutes after the surgery was completed. According to Oblak, this was the first time a 3D-printed skull replacement of this size had been implanted. While vets in the UK have performed a similar surgery, this procedure was on a far smaller scale. Oblak hopes that this type of treatment can someday be used to help humans.